Our individual valve Expansion Cell™ wind chest and multiple regulator wind system offer clever solutions to odd and unusual spaces. Any organ can be successful when encased within the listening room. It takes special techniques to get musically satisfying results from an organ chamber. We do not ever look down on a chambered installation as second best. 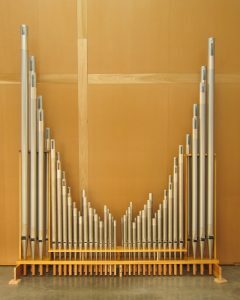 We like chambers for their extra advantage in dynamic control – especially important in church organs. When a building has little resonance, it is up to the organ to make up the difference. Our style of tone is uniquely suited to situations where an ordinary organ would sound harsh and strident. Every project regardless of size is designed, built and finished by the same team of experts. Small stop lists often require more creativity than large ones. A successful small organ is the real hallmark of a great builder. Our musical approach to tonal design combined with the Schoenstein action system, especially our wide-range of expression, make small instruments do far more than is expected of them. Our small symphonic organs and those in the English and French styles have won acclaim for their beauty, versatility and grandeur of tone. 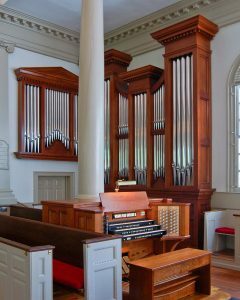 We believe that the church organ is a specialized type of organ not only because of its role in leading the congregation and supporting the choir, but because it is heard by the same people week after week, year after year. Its tone must be pleasing and engaging so as not to lose its inspirational appeal over time. To serve its purpose it must have many different accompaniment and solo effects and a suitable bass. The church organ must accompany well. If this goal is achieved, the ability to render the solo repertoire will follow. In other words, the church organ is a more comprehensive musical medium than is the concert organ. Beauty of tone alone is not enough. The tone must also be appropriate to its use.